At 17th NEO had/has (depends on timezone) its 2nd aniversary. If you dont remember it launched as Antshares and then upgraded code, changed into NEO and.. price skyrocketed. ICO price was 0.032USd and now we have.. 16.623 USD. Notice that top volume for this has Chinese exchanges and i told you to get on some of them ie BiBox, BitForex or Lbank as they have no KYC. Also NEO has token on itself like ETH.. most of them has another Chinese spot - KuCoin. Really all my readers should have accounts on this places and trade them. AntShares was my first coin. ok ok Bitcoin first then AntShares. BiBox, BitForex or Lbank KYC. I get to know them, thanks! With all the innovations of SMT, Steem will surely establish such price movement. It's only a matter of time. Thanks for the free eBook, hope to read & digest it very well. Started to buy as it was still AntShares but bought more on the way up. Would love to see the price increasing again. 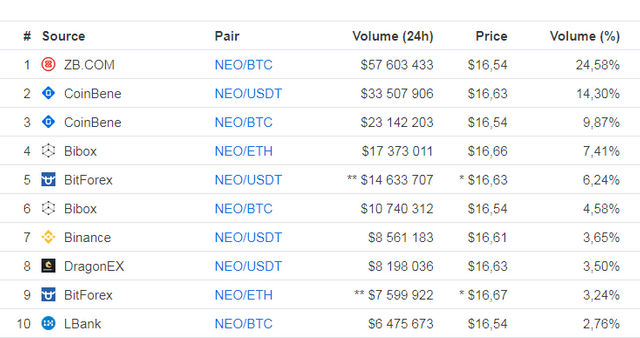 It´s very quite around NEO at the moment. Your UA account score is currently 7.319 which ranks you at #63 across all Steem accounts. In our last Algorithmic Curation Round, consisting of 319 contributions, your post is ranked at #5.